Matt gives a rundown of Microsoft's E3 booth offerings. Microsoft had a decent number of games playable in its booth this year, and it is smart enough to open it up outside of E3 hours to give everyone enough time to get hands-on – something that’s next to impossible during the day. As such, the only Xbox games I didn’t play were MOBA Gigantic, Gears of War Ultimate Edition, and perhaps one or two tiny indies. Here’s what I thought of what I did play. The Solus Project was a really nice surprise. A first-person survival adventure from Swedish developer Teotl Studios (Unmechanical) and Grip Games (Q.U.B.E: Director's Cut, Tower of Guns), it puts you in the space suit of an astronaut on a mission to save a mankind. Unfortunately, your spacecraft crashes on an uncharted planet called Gliese-6143-C, and you must save yourself before worrying about your species. In order to do so, you must regulate things like your hunger level, thirst, and body temperature, all while finding a way off this dark and seemingly lifeless rock. Running on Unreal Engine 4, Solus has tons of atmosphere despite an oppressive colour palette. In fairness to the game’s artists, you are on a planet that’s supposed to be completely bleak and inhospitable, and boy does it feel it. When I awake from the crash, there are parts of my ship scattered amongst dozens of weird rock pillars, and a gun metal sea surges into the shore in the background. It’s raining, and that rain soon turns to sleet as I collect food, water, a flashlight, and tools, then search for shelter. I can only carry so much though, so plenty is left behind. Meteors burn up overhead or crash into the planet’s surface, and another planet looms far too close overhead. The island I’m on isn’t massive, but I can’t swim anywhere and there is a large structure in its middle that resembles an alien fortress built into a cliff. I can circumnavigate this thing, but there’s little of interest aside from a locked door beyond the body of Yuri, a fellow astronaut who obviously didn’t survive the impact. I find a large key, open the door, and am finally out of the rain and in a temple whose exacting lines and sparseness remind me of similar structures from the Alien films. There isn’t much in the room I’m currently in, save for the skeletal remains of about half a dozen humans, and a mechanism of some sort that obviously grants me passage deeper into the complex. I don’t find out what’s behind that door though, as the hypothermia that’s dogged my outdoor wanderings claims my life. 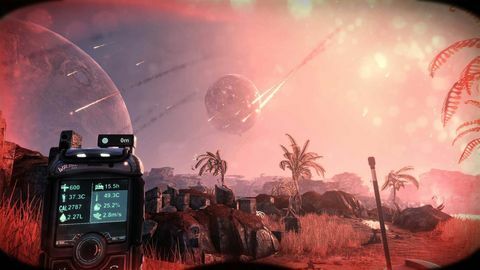 It’s all pretty unsettling – you’ll want to play in a rug with a hot drink – but The Solus Project now has my attention. 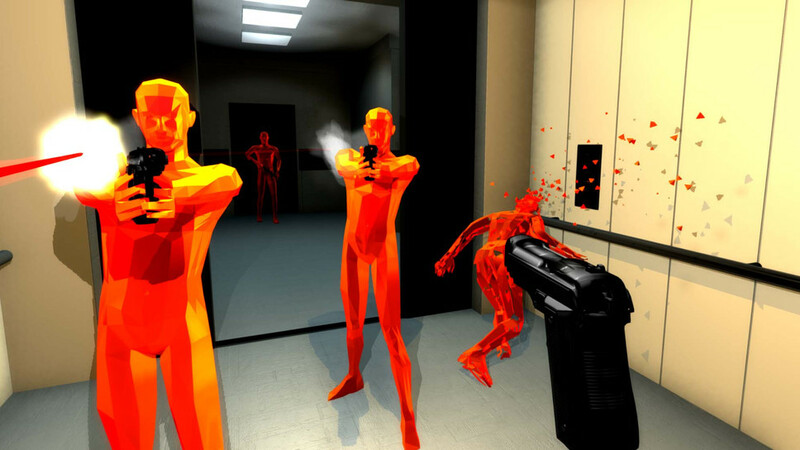 I first played minimalist FPS Superhot back in 2013 when it was a browser game, and liked it a lot. Of course, the game has expanded a lot since then thanks to a successful Kickstarter, and it’s looking great. For those unfamiliar, time only moves forward in Superhot when the player moves, so it’s a lot like playing Neo in The Matrix. The game has awesomely crisp black, white, and red visuals, and the vibe now evokes the paranoia and dread of Hotline Miami – there’s very stylised violence as glasses are smashed into faces and pixellated blood flies as bullets find their mark, but there's also strange orders given, and hints dropped that you might be controlling someone against their will. Other than new levels, the biggest changes since I last played are you must now move to reload, there is a shotgun, and you can punch enemies to disarm them, catch their gun on the way down, then shoot them with it. It’s a truly original game that’s part shooter but mostly strategy, and I can’t wait to jam it when it comes out at the tail end of this year. Cuphead had us oohing and ahhhing after its brief appearance in Microsoft’s presser at E3 last year, and I can happily report that it is just as weird as I had hoped. A co-op shooter/platformer that’s accurately pitched as ‘Contra meets the cartoons of Fleischer Studios’, Cuphead is an uncompromising but gorgeous title that’s both unpredictable and wonderful. It’s essentially a series of single-screen boss battles that may be tackled in any order thanks to a cutesy overworld. Its cartoony visuals and original jazz soundtrack make it stand out immediately, and its enemies are delightfully creative: giant mermaids, pirates, a skeleton train, giant toads wearing boxing gloves that summon tornados, a huge angry carrot and that rains down small homing carrots and shoots ring-shaped psychic waves – it’s wacky to say the least. It also plays very well, with precision air control after jumps and a variety of attacks for you to unleash. There’s also a special meter that fills when you parry certain enemy projectiles, allowing you to unleash a laser that deals decent damage to otherwise-unflappable bosses. I'm looking forward to seeing if Cuphead and Mugman can pay off their debt to the devil when the game launches sometime next year. Fable Legends is probably not the game Fable fans were hoping for. Taking place several hundred years before the events of the original trilogy, it’s a free-to-play title that tasks a team of up to four players with battling their way through levels populated with monsters and traps placed by a fifth. The game's heroes each have unique abilities that roughly conform to the standard tank/ranged/rogue/fighter archetypes. I played Sterling, a wisecracking Prince Charming-type fellow whose moves consisted of light and heavy attacks with a rapier, as well as an evade roll, a slap, and – once unlocked – a dagger throw. Levels are linear, but with a reasonable amount of width. We fought our way through a forest, killing fairies, animated trees, and goblins, while avoiding (or not) traps like mines and spikes. There were two sections to get through, and a boss at the end of the second that took us all out despite our ability to revive each other. There were some camera issues, with scenery blocking the action when I got too close to the boundaries of any particular area. I’m also not convinced that it would be much fun to be the dungeon master, although that’s an absolute guess – we didn’t see how any of that side of things worked. It apparently plays like a much-simplified RTS. Legends was all a bit rote to be honest, and seemed a bit simple too. Apparently you will be able to customise your weapons, armour, abilities, and look, but none of that was present. The enemy designs we saw weren’t particularly inspired, and our movesets were small. Basically, there wasn’t much on display that made me think I really needed to play this game, which is a shame, as all of Microsoft's other offerings were top-notch.